My 28th Birthday Celebration: Mean Girls Party! No Mean Girls party would be complete without a Burn Book to comment on all of your friends. I started with a Pretty Pink Smash Folio that I purchased from my local Target in the scrap booking section. I then added some awesome Mean Girls stickers with my favorite movie quotes from RedBubble. As my friends arrived, I took their picture with my Polaroid 300 Instant Camera, quickly developed their photos, and added them to the book. If you're wondering at all, my Smash folio came with a dual ended pen and glue stick. ;) Once all the ladies were added, we passed the book around with my Smash pen and other sharpies for the girls to add comments. You can see my page pictured above! As you can see above, I displayed the Mean Girls inspired dinner menu in a simple frame for an instantly chic look. I bought a few of these frames years ago from Target, specifically to use them when hosting parties. We Should Totally Just Stab "Caesar Salad"
Amber Delessio Made Out with a "Hot Dogs"
Whatever. I'm Getting "Cheese Fries"
Do You Wanna Go To "Taco Bell"? Taking more inspiration from the movie, I decided to bake "Cupcakes Filled With Rainbows & Smiles" for us to eat and be happy! :D As you can see pictured below, instead of having a typical birthday cake, I displayed the cupcakes on a tiered cupcake stand I borrowed from my mom. To make a rainbow effect for the cupcakes, I used a single box of Duff Goldman's Tie-Dye Premium Cake Mix. I separated the white cake batter into 6 bowls then dyed each bowl a different color, according to the directions on the box. I spooned the different colors into each cupcake liner, making sure to not stir the colors together. I was a little skeptical of my baking abilities, but they turned out AMAZING! I separated and displayed the various cocoa and coffee toppings in standard and blue mason jars. There were some great goodies to choose from, including: Candy Cane Hershey's Kisses, Fair Trade Chocolate, Peppermints, Hazelnut Milk Chocolate Pirouettes, & Candy Canes. After the Girls were full and were settled with their cocoa and coffee, we finally watched Mean Girls. Following the movie, I had the girls separate into teams of 2 or 3 to answer some fairly difficult movie trivia. As I'm a huge fan of the movie, I wanted to be sure there was a clear winning team. Here's a link to some example questions. The winning team had the choice between two different prizes by answering the following question: "Do you wear pink on Wednesdays or are moderately priced soaps your calling?" Depending on the response, they either won a Victoria's Secret PINK gift card or a Bath & Body Works gift card. Due to rainy weather in the Bay Area, I wasn't able to run outdoors for a good two weeks. Seeing as I like to run at least three times a week, I don’t currently have a gym membership, and I was definitely overeating due to the holidays, you can understand my dilemma. Once the rain let up, I was eager to hit the pavement hard, but I was a little hesitant of how my body would take it. 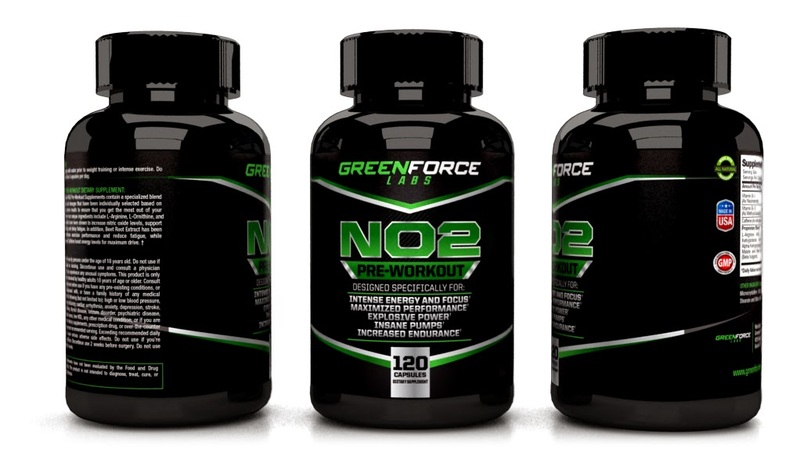 Luckily, I found GreenforceLabs’ NO2 Pre-Workout Supplements to help me get back into my usual running routine. This workout supplement was specifically designed to ensure you get the most out of your workout. This includes intense energy and focus, maximized performance, explosive power, insane pumps, and increased endurance. It’s formulated with Vitamin B-3, Vitamin B-12, Caffeine, L-Arginine, L-Ornithine, L-Citrulline, and Beet Root Extract. L Arginine, L Ornithine, and L Citrulline can help increase nitric oxide levels, support muscular energy, and delay fatigue. Plus, Beet Root Extract can enhance exercise performance and reduce fatigue, while Niacinamide and Caffeine will boost your energy levels for maximum drive. I must admit that I was a little doubtful about taking it at first, as I've never tried any pre-workout supplements before. Luckily, my doubts quickly disappeared. During my first run using the supplement, I found that it definitely gave me a boost of energy mid-run. When I'd usually reach my running "wall" of a distance, instead of slowing down my pace and preparing to end my run all together, I found I was able to push forward and keep going for miles longer than I have in the past. In general, I take two capsules with water right before my run. I feel about the same without taking any supplements as I’m getting into my usual pace. But then 20 minutes into my run, I’ll feel the boost, keeping my body in motion. On days when I’m feeling particularly sluggish or too lazy to want to even run at all, I’ll take four capsules and wait to feel burst of energy before lacing up my shoes. It’s advised to take four capsules prior to weight training or intense exercise per the directions on the bottle, but I feel that the usual two capsules work best for me. Also, if you’re sensitive to caffeine like I am, I’d suggest taking a smaller dosage as well. Special thanks to BrandBacker and GreenForce Labs for sponsoring this post. Instead of having a New Year's resolution for 2015, I've decided to set goals for myself to work towards throughout the year, as I've done in previous years. If you missed last year's post, check it out here. Again, I've set goals in 5 important areas of my life: Career, Finance, Relationships, Spiritual, and Wellness. Along with these goals, I've chosen small tangible steps to take daily that'll help me achieve my goals within the year. Using this method, I accomplished 12 out of the 14 goals I set last year. In 2014, I managed to earn a promotion and pay raises, keep my blog active, continue to pay down my debt and school loans, strengthen my friendships with my co-workers, spend more time with my family, live more optimistically, be kind, inspire others, run 2 Half-Marathons, drink more water and tea, eat pescatarian more often, and be more mindful of the foods I eat. With the accomplishments I've made within this last year, I knew that I wanted to do this again. That said, here are my goals for 2015! - Speak up during meetings and don't be afraid to share my ideas and opinions. - Create a new blogging, filming, and uploading schedule. - Stop using credit cards! - Consistently pay all monthly bills. - Save 10% of every paycheck and any extra funds whenever possible. - Take time to enjoy life and fulfill your wanderlust. - Continue to look on the bright side. - Continue to perform random acts of kindness. - Continue to be supportive of other's dreams and goals. - Run 4 times a week. - Buy fresh produce whenever you go grocery shopping. - Order salad 1/3 of the time when eating at a restaurant. I'm super excited to see what 2015 will bring! I hope I'll be able to achieve majority of my goals this year, as I've done in previous years. What are your New Year's resolutions or goals for 2015? Let me know in a comment below!